It’s time for another Cents of Style Fashion Friday! Today only you can purchase shoes and a scarf for $21.95 plus free shipping with code MIX. Have you tried mixing prints? I’m sure you’ve seen it if you follow fashion blogs or flip through the fashion magazines. If you’ve wanted to try this trend, but you weren’t quite sure where to start, mixing prints with your accessories is the perfect place to start. Why? It’s both easy and affordable. 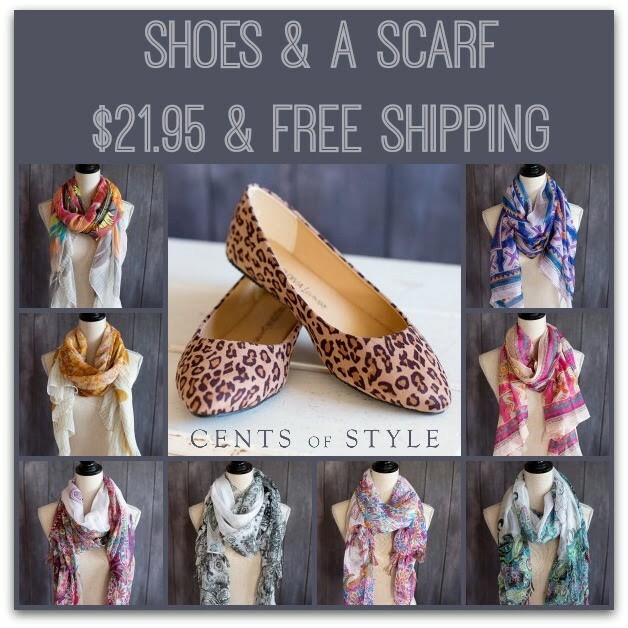 Start with a pair of leopard print shoes and a bold print scarf with this deal for only $21.95 plus free shipping. It gives you a chance to “try the trend” without breaking the bank. Throw on a pair of jeans and a t-shirt and you’ll be ready (and very fashionable) for your kids’ sports game or a casual night out. Just go here to purchase your shoes and a scarf for $21.95 plus free shipping with code MIX. This deal is good for today only, March 21st!